Groups can shorten the length of stay or number of beds up to two months or greater prior to arrival date for no charge. If modified less than two months in advance the there is no refund. Reservations can always add more beds or days depending on availability, and will be upheld to the original cancellation/modification dates. Cancellations done two months or greater prior to arrival will receive a refund of the remainder if this has been charged by the property.There is no refund if cancelled less than two months prior to arrival. No shows forfeit the full balance, and the beds will be reallocated. We urge reservations to alert us of any late arrivals. By making this booking you are ok with staff reception hours may be limited when large groups are present and the pub could also have reduced hours catered to your groups needs. A security deposit of up to 10 EUR per person will apply (especially to stag/hen groups) and will be returned after check-out inspection. Children under 18 must have adult supervision at all times. 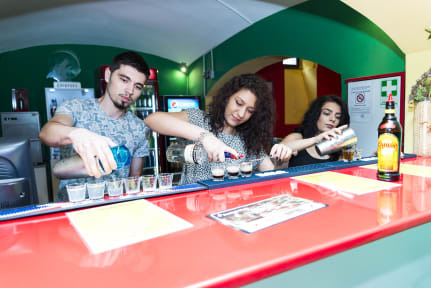 All groups are subject to leaving a deposit of 10 EUR each or their passport to be held until a check-out inspection, to ensure proper behavior is upheld and there are no damages. For groups of 9 or more people, there will be sent an invoice once the free cancellation period ends, and the entire balance is due immediately and will be charged on the Booker's card. The balance can be paid via Visa / MasterCard .If the deposit is not paid in time, the booking will be automatically cancelled. We are in the heart of the city, just a few minutes walk from most attractions and public transport: Unirii Square and the nightlife district of Lipscani which is the pedestrian only Old Town. Our quiet street is the best starting point to explore the city! Our very own pub and common room has Ping pong (table tennis), Foosball and a giant Jenga. We have a large selection local and imported spirits, wine and beer. We have 2 day outdoor terraces. We have a bitcoin ATM and a normal bank ATM in our property. 5 internet lines will guarantee you stay connected with family, friends and Netflix. Beer prices in our pub start from 7 Ron. We take safety seriously at X Hostel: personal lockers, a combination of codes for doors, closed circuit cameras in most common areas and all entrances, security firm on call, 24h staff on-site. Bucharest is a very safe city where you can walk around at all hours especially in our district. X Hostel is located in a 1917 villa. We sport a great selection of rooms to fit any budget: small to larger size dorms, private en-suite twins & doubles (all with air-conditioning in summer time). We have plenty of showers and toilets so you'll never have to queue. We can recommend you all kind of local food and drinks, help you organize transfers trips and tours in the region and advise you on what to do day and night. Didn't really work for me, but then I was only there for one night, so who knows. Staff was not terribly helpful and the internet did not work well in my dorm. Probably cool for groups or partiers, but not my cup of tea.